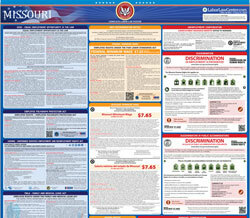 The La Discriminiacion En La Vivienda Esta Prohibida is an equal opportunity law poster by the Missouri Department Of Labor & Industrial Relations. This poster is mandatory for some employers, including employers that have public accommodations. This poster, written in Spanish, must be posted in a conspicuous place where all potential and current homeowners and renters that speak Spanish will see it. This poster describes the rights that potential and current homeowners and renters have to not be discriminated by any basis mentioned on this poster as well as what practices are considered discrimination and who to turn to if one feels discriminated against regarding this law. It appears you don't have a PDF plugin for this browser. Please see the link below to download missouri-mchr-7-s-ai.pdf.